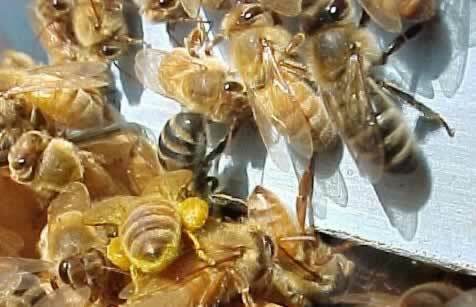 Pollen from flowers is the food which honeybees bring back to the beehive to feed the baby bee larva. Pollen is high in protein and rich in nutrients. The worker bees collect the pollen grains from the male parts of the flowers, known as anthers. They use a special structure on their legs to comb the tiny pollen grains off of their hairy bodies and pack it onto another structure on their rear legs called pollen baskets. When the pollen foragers return to the bee colony they scrape the pollen off their legs and place it into an empty cell of the honeycomb. Another house bee will come by soon and pack it tightly down for storage. During storage, beneficial microbes added by the bees, known as probiotics, will partially digest the pollen making the nutrients more available to the bees. At this point it is known as bee bread and is ready for use as food. Nurse bees who are only 5-15 days old, will eat this pollen which will then be converted into royal jelly by a special gland in their head, this will be fed to the young larva for three days. 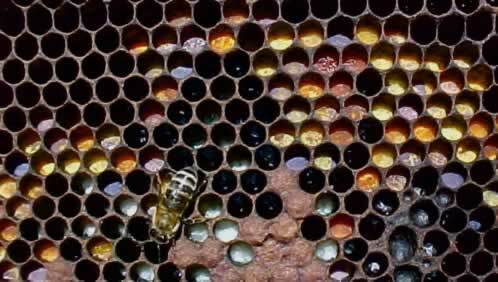 If the royal jelly is fed beyond three days, the larva will begin development as a queen bees. Thus the difference between a worker who may live only 6 weeks and a queen, who can live several years, is controlled by the diet she is fed as a larva. Beginning beekeepers click here for advice on getting started in beekeeping.